Welcome to the new and contemporary Holiday Inn Express and Suites Olathe Hotel. 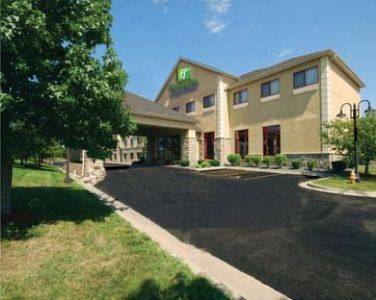 Nestled off I-35 and 119th Street, the Holiday Inn Express and Suites Olathe hotel is minutes from I 435, HWY 69, Johnson County Executive Airport (OJC), the New Century Airport and just 45 minutes from the Kansas City International Airport (MCI). We are also conveniently accessible to all that Kansas City has to offer and a 15 minute drive from destination areas such as downtown Kansas City, Sprint Center, Kauffman Center and the Convention Center. The hotel is a short drive to the Country Club Plaza, Nelson Atkins Museum, Crown Center, Westport, Worlds of Fun, Casinos, Children's Mercy Park, Kauffman and Arrowhead Stadium, Kansas Speedway and the Kansas City Zoo. Take in the arts with local theatres and museums or get a taste of the areas famous BBQ. Whether in town for business or pleasure, our Holiday Inn Express & Suites Olathe hotel offers contemporary comfort with a feeling of home. Start your day with a complimentary hot breakfast and enjoy a plethora of amenities including high-speed Internet, oversized guestrooms, Olathes largest indoor pool and spa oasis, and room service from the award winning Johnnys Italian Steakhouse. The hotel features a business center, fitness center, meeting space, boardrooms, and Jacuzzi suites are available. The hotel is also located near Garmin, John Deere, Farmers Insurance and Sprint. Oregon Trail: 1073 Square Feet of meeting space. Prairie HighlandsRanked #3 among the states best public courses.